What homeowners should know about foreclosure. Getting expert advice in a timely manner is key. TAMPA, Fla. - Dec. 17, 2018 - PRLog -- Foreclosure is a scary process for homeowners. If you have received a foreclosure notice, it is very likely that you and your family have been under financial stress. Many people do not know what to do after receiving a foreclosure letter. We have helped many Tampa Bay residents who have undergone the same fate. The good news is that you have options. We want to address several misconceptions about foreclosure. 1. Once a Foreclosure lawsuit is filed, there is little or nothing that can be done. Absolutely not true. The case can be defended and even in certain circumstance it can be dismissed. Additionally, settlement options can be explored such as loan modifications, short sales, cash for keys, or cash buyouts. 2. When you are in foreclosure, you cannot sell your house. This is not true. Owners have a few options. They can sell their house by a conventional sale, as long as they have equity in the property, or by short sale. 3. If someone is turned down for a loan modification, they cannot apply again. If someone is turned down for a loan modification after completing the loan mod package, they can apply again IF circumstances have changed; such as income increase or reduction of other debt obligations. Also, you can apply again if the original package was not complete with a full application and all request documents. 4. Bankruptcy is not a good option. This is simply not true. A discharge in bankruptcy can protect you from personal liability of the underlying debt and temporarily stop a foreclosure sale. Additionally, there may be better opportunities to modify under the Bankruptcy Court's umbrella. 5. The Bank cannot foreclose if they do not have possession of the original Note. An experienced foreclosure attorney can use the lack of possession of the original Note as strong negotiating and defense tool. While it is trickier to foreclose without a Note, Banks obtain judgments routinely without a Note against borrower who represent themselves. It is critical to get legal representation in order to research every avenue based on your circumstances. We fight on behalf of homeowners against foreclosure in the Tampa Bay area daily. Every case is unique and we understand the struggles and we can suggest the right options for you. We've been able to help many get refinancing and stay in their homes. 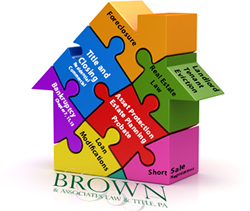 For more information, please contact us at (813)528-4044 or visit our website www.weknowrealestatelaw.com/foreclosure.html.